Busa (also known as Busha, Bosnian, or Illyrian) cattle are a small breed of cattle that belong to the shorthorn cattle group. They are found throughout southern parts of former Yugoslavia (Dinaric Alps), Bosnia, Croatia, Macedonia and Serbia. Some sources state that the breed has existed around the Balkan Peninsula since Neolithic times. Busa cattle from Croatia and Bosnia were crossed with an Austrian breed in the 19th Century. And this cross is larger than the original Busa and it is exclusively grey. The Yugoslav army brought Busa cattle from Serbia during the civil war in the 1990s, and those animals were all used for meat supply. Currently the Busa cattle and their cross breeds are widespread over the former Yugoslavia. They are mainly kept in Bosnia, Kosovo, Macedonia, Herzegovina, Serbia and parts of Croatia like Lika and Dalmatia and also in Montenegro. Busa are small sized cattle with a compact body. They are unicolored brown, although their color varies according to the regional strain. For example the strain from the Macedonian strain is blue-grey, while the strain from Metohija region of Yugosalvia are red. And there are three strains in Serbia which are black, grey, and red. Both bulls and cows usually have small horns. The average body height of the bulls is about 120 cm at the withers, and about 115 cm for the cows. The mature bulls on average weight around 450 kg. And average live body weight of the mature cows is around 300 kg. 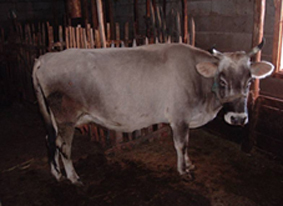 The calves of the Busa cattle are relatively very small. Average birth weight of the calves is about 15 kg. They are a multi-purpose breed of cattle. They are used for both milk and meat production, and also good for using as a draught animal.